Hayley Snow loves her job as the food critic for Key Zest magazine, tasting the offerings from Key West’s most innovative restaurants. She’d rate her life four stars, until she’s forced into the spotlight…and another murder investigation. 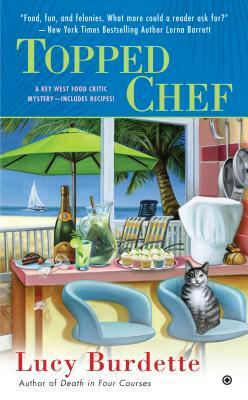 Hoping for some good publicity, Hayley’s boss signs her up to help judge the Key West Topped Chef contest. Stakes are high as the winner could be the next cooking-show superstar. Hayley shows up for the filming nervous but excited, until she sees who’s on the judging panel with her: Sam Rizzoli, big shot businessman—and owner of the restaurant she just panned in her first negative review. When Rizzoli turns up dead, the police assume his killer is one of his business rivals. But Hayley wonders whether someone is taking the contest a little too seriously. With the police following the wrong recipe, it’s up to Hayley to find the killer before she’s eliminated from the show…permanently. Clinical psychologist Roberta Isleib, aka Lucy Burdette, has had ten previous mysteries published. Her books and stories have been short-listed for Agatha, Anthony, and Macavity awards.